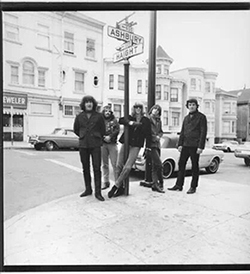 Love on Haight: the Grateful Dead and San Francisco in 1967--a new exhibit commemorating the 50th anniversary of the historic Summer of Love--has just opened at McHenry Library’s Dead Central. 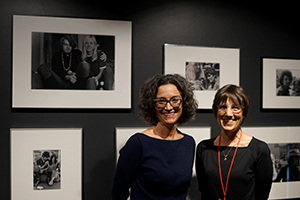 Highlighting materials from multiple collections housed in the Library’s Special Collections & Archives, the exhibit features posters, photography, and memorabilia from the Grateful Dead Archive and photographs from Ruth-Marion Baruch’s 1967 Haight-Ashbury series. It also spotlights a selection of items from the Library’s exceptionally rich holdings in alternative publications from this colorful time period, including a variety of newspapers and magazines, comic books, literary journals, broadsides, and political tracts. 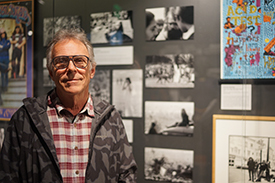 “This exhibit documenting the Summer of Love comprises only materials held by the University Library,” noted Elisabeth Remak-Honnef, head of Special Collections & Archives at UC Santa Cruz. Remak-Honnef added that there is a reading corner upstairs in Special Collections on the third floor of McHenry Library for those visitors who are interested in actually browsing some of the publications on display. 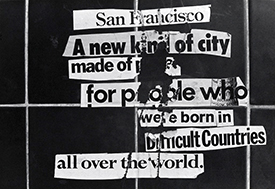 It includes conventional and alternative publications such as the Oracle, Berkeley Barb, and Zap Comix, as well as controversial works such as Michael McClure's Beard and Lenore Kandel's Love Book. There is also an audiovisual component of the exhibition featuring films about the Summer of Love, bits of performances, and music. 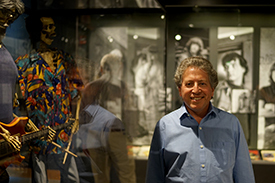 Poetry, theater, and news reports from mainstream and alternative sources additionally provide multiple perspectives on the phenomenon of the Summer of Love and the role of the Grateful Dead. Remak-Honnef noted that all of the special collections at McHenry Library are open for research and accessible to the public. The exhibit will be on display through June of 2018. Admission is free and open to the public during regular library hours.